The 20,000 or so species of pollinators are key to hundreds of billions of dollars' worth of crops each year—from fruits and vegetables to coffee and chocolate. 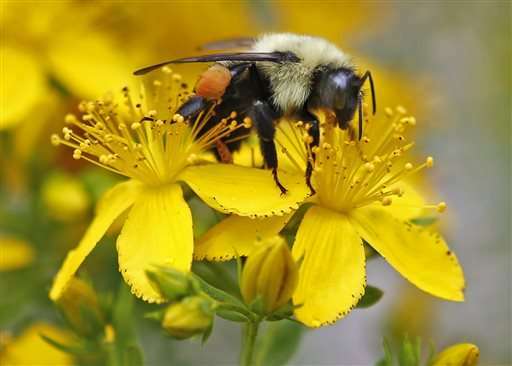 Yet 2 out of 5 species of invertebrate pollinators, such as bees and butterflies, are on the path toward extinction, said the first-of-its-kind report. Pollinators with backbones, such as hummingbirds and bats, are only slightly better off, with 1 in 6 species facing extinction. The report is the result of more than two years of work by scientists across the globe who got together under several different U.N. agencies to come up with an assessment of Earth's biodiversity, starting with the pollinators. It's an effort similar to what the United Nations has done with global warming, putting together an encyclopedic report to tell world leaders what's happening and give them options for what can be done. But these are problems that can be fixed, and unlike global warming, the solutions don't require countries to agree on global action—they can act locally, said Robert Watson, a top British ecological scientist and vice chairman of the scientific panel. The solutions offered mostly involve changing the way land and farming is managed. In a statement, Christian Maus, global pollinator safety manager for Bayer, which makes neonicotinoids, said: "The report confirms the overwhelming majority of the scientific opinion regarding pollinator health—that this is a complex issue affected by many factors. Protecting pollinators and providing a growing population with safe, abundant food will require collaboration." The story of honeybees is a bit mixed. Globally over the last 50 years, the number of managed honeybee hives—ones where humans keep them either as a hobbyists or as professional pollinators—has increased, but it has dropped in North America and Europe, where there is the most data, the report said. A drop in human population back to the levels in 1700 could be a good thing for the well being of the planet?